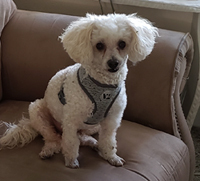 About Bosh ADOPTION PENDING: Little male cream colored poodle with apricot highlights. Making Friends with Bosh: Very affectionate and other than occasional barking when someone comes to the door, well behaved. Does have separation anxiety. Likes to go outside in the fenced yard and run around but really loves to lay in the sun. A real cuddle bug.